We are so excited to announce that we are presenting at the Latin Billboard Music Conference & Awards on April 23 at 11:15am on the main stage.The presentation will highlight the power on YouTube as a platform for artists, labels, and publishers for global distribution and monetization. Award winning artist Jencarlos Canela will join me on stage to perform!! The performance will be recorded and uploaded by Rene Merideth, Exploration’s Co-founder, to YouTube in real time and then shared around the world. I’m going to share the work we’ve done leading up the event, specifics to the video upload to ensure success over the long term, tools for global distribution, and the power of deep analytics. 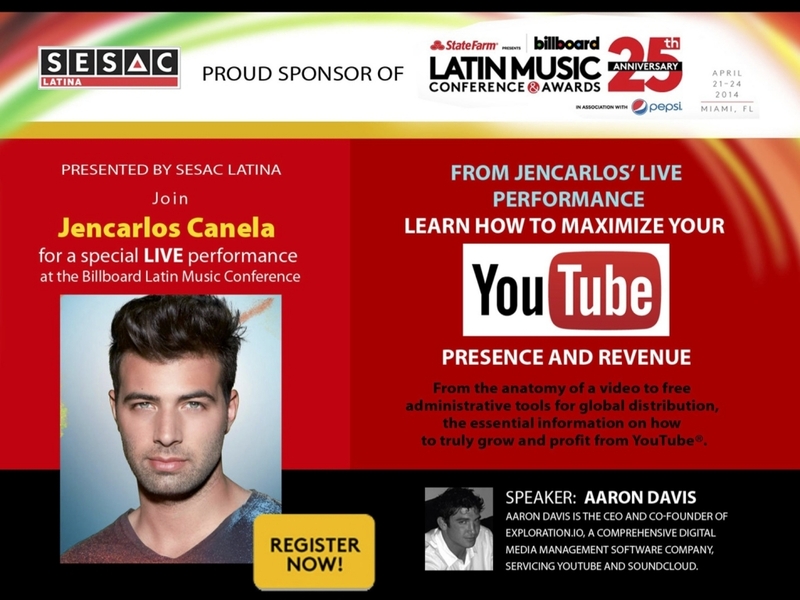 Please join us in watching and sharing the video as soon as soon as it is LIVE by subscribing to SESAC Latina’s YouTube channel and by following @jencarlosmusic, @sesaclatina @billboard, and @explorationio. The entire event would not be possible with out the generous support and encouragement of SESAC Latina‘s JJ Cheng and the entire SESAC Latina team in Los Angeles and Miami. Thanks again to Billboard Magazine and Leila Cobo for having me on stage to explain how YouTube can be a great asset to creators and those that represent them in Latin America and around the world.